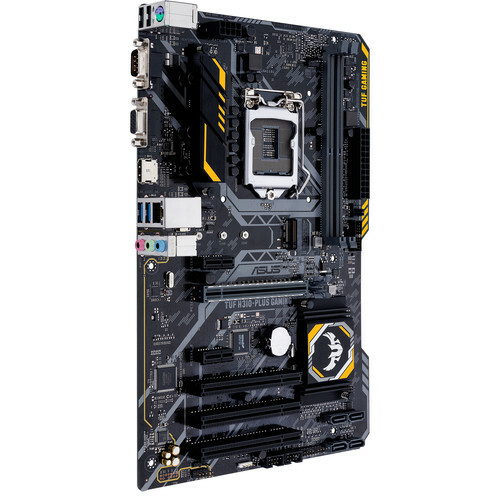 Powered exclusively by 8th Generation Intel Core processors, the TUF H310-Plus Gaming LGA 1151 ATX Motherboard from ASUS supports the Intel H310 chipset and the LGA 1151 socket. It is designed for 24/7 performance in ATX cases and is compatible with DDR4 memory, plus HDMI and VGA display outputs. Unlock your system's full potential with SafeSlot and Fan Xpert 2+, while M.2 and Gigabit LAN maximize connectivity and transfer speeds. TUF components provide enhanced system durability and this motherboard is protected by a limited 3-year warranty. Designed exclusively for 8th generation Intel Core processors to maximize connectivity and speed with M.2, Gigabit LAN, and Intel Optane memory compatibility. Fan Xpert 2+ provides advanced fan and liquid cooling controls for dynamic system cooling and management. Box Dimensions (LxWxH) 12.9 x 10.4 x 2.2"
TUF H310-Plus Gaming LGA 1151 ATX Motherboard is rated 4.0 out of 5 by 1. Rated 4 out of 5 by James from solid motherboard that doesnt cost an arm and a leg Bought this as part of an upgrade to move my PC from a 3rd gen to an 8th gen i-7. Its bus speed is one of the lower of the 300 series boards I looked at, but so is the price. Has overclocking settings if you paired it with an unlocked CPU. The only real issue I have is the lack of documentation included in the box. I was used to a readable picture labeling all the header connections. what I got was an unlabeled, barely viewable picture in the booklet and a QR code that said scan this for the header map. The header map was for all Asus boards - check your board and know what headers youll need.